Sometimes actor headshots in New York City take a hilariously unexpected turn. And I love it when they do! Most headshots are very simple types of sessions. They are exactly what you’d imagine a headshot session to be. Actors and actresses find me online, or they get referred to me by a friend. We chat by phone or email about the session. They tell me what they are looking for. I talk about how my sessions are run. We agree on a date, and the shoot happens. Simply Christmas album by Leslie Odom, Jr. Sometimes a headshot session takes a fun turn for the unexpected. 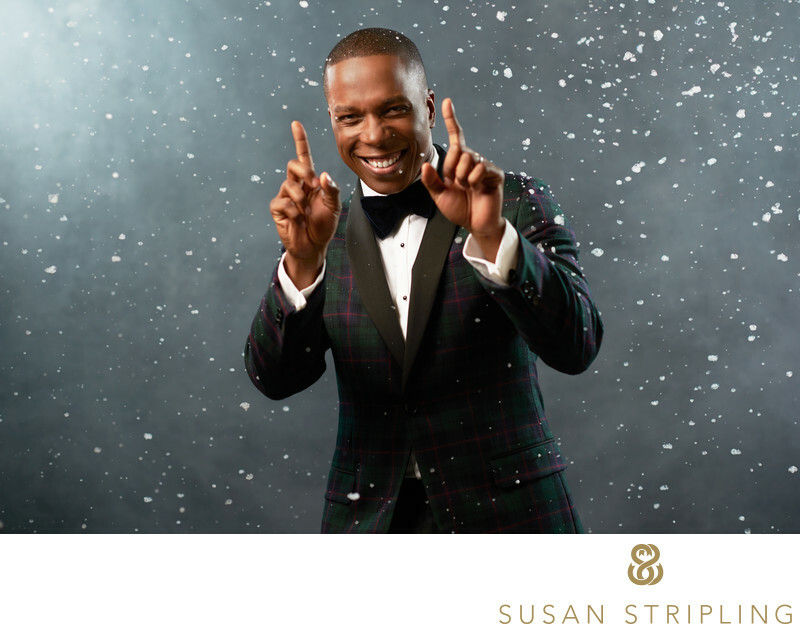 At this 2016 shoot, Leslie Odom, Jr. had the idea to create a headshot session around the upcoming release of his holiday album, Simply Christmas. I was in love with the idea immediately. I adore how this unconventional spin on traditional headshots ended up being a wonderful social media marketing campaign for this remarkable holiday album! I first met Leslie Odom, Jr. after a Friday night Hamilton performance. I had taken a friend to the show with me, and we got to talk to the lovely Leslie when the show was over. We talked about wanting to shoot soon, but after that day time took over and life kept moving and that shoot never got scheduled. I kept meaning to reach back out, but somehow never did. After a few exchanged Twitter messages over the ensuing months, I ran into him again at the Josh Henry and Cynthia Erivo concert version of Jason Robert Brown’s “The Last Five Years.” I had been sitting two rows behind Leslie, and we chatted again about a shoot. With the Christmas album upcoming, he needed some promotional images. An idea for a unique headshot session was born, and we put a date on the calendar for the next week. Knowing that he wanted to capture some headshots that evoked the feeling of the holidays, I set out to brainstorm some ideas. Actor headshots in New York City are usually a straightforward affair, but this was something a bit different. I wanted to represent Leslie as the sophisticated song stylist that he is, and the incredible presence that he radiates. I made sure that my Oliphant backdrop was hung and ready. I loved the moody feel of the gray painted backdrop, and knew that lit properly it would look like a snowy night sky behind my subject. I set up my Profoto lights. I pulled out my beauty dish, and set it up. I set up my Elinchrom Rotalux Octabox and put it on a weighted-down light stand. I tested each lighting setup meticulously, wanting everything to work just right for the day of the shoot. Even thought I could have set up the morning of the session, I wanted everything to be set and ready well before the shoot happened. Nothing is worse than feeling flustered at a shoot while you’re getting your gear together! I always find it so much better to prepare beforehand. Early on the day of the shoot, Leslie’s stylist sent over a wardrobe. There were wonderful wintery garments, sophisticated suit jackets, and fantastic pants. He had some balloons delivered to the studio in a cheery assortment of reds and greens. I also arrived early on the shoot day to add Froggy’s Fog mix to my snow machine, ready to make it snow inside my studio building! I was most excited about creating a snowy atmosphere. It was something I had always wanted to try in the studio, but never had just the right shoot to make it happen! This is one of my favorite images from the shoot. I love how the faux snow in the background pops right off of the deep gray of the Oliphant backdrop. I love how the combination of the Profoto lights with the beauty dish and the Elinchrom Rotalux Octabox light Leslie in a perfect way. I also love how the positioning of the lights makes the snow pop even further off of the background! More than anything, I love how this perfectly embodied the feel of the Simply Christmas album. This headshot is cheerful, warm, wintery, smooth, and sweet. Just like Leslie and his album! 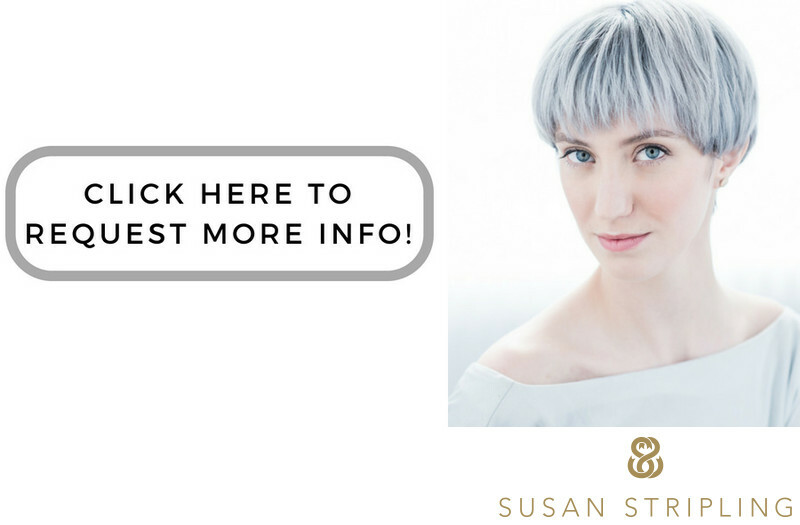 If you’re looking to shoot a headshot session that isn’t just for your everyday audition purposes, I’d love to talk to you. Perhaps you’re looking for promotional images for an upcoming album. Maybe you’ve got your first 54 Below show coming up and you need some images to promote that show specifically. Perhaps you have another concert appearance that needs a particular type of promotion. It could be anything at all! If this is the type of shoot you’d like to do, I’d love to hear from you. I want to hear about the reason behind this session. I’d love to know a bit more about what you’d like to do with the images. Are they for the web? A billboard? Your social media account? A website? I love being part of the creative concept of an unconventional set of actor headshots in New York City! If you’re not sure precisely what you’d like your shoot to look like, let’s talk. You can come to the table with a fully fleshed out concept. You can call me and not know anything about how to execute your creative vision, but knowing what you want your images to feel like. You can know none of the above! If you don’t know where to start with your headshots, let’s talk. I can help you make your vision - no matter how currently blurry! - a reality. And if you want to make it snow inside in the middle of the summer, you know we can make that happen! Keywords: broadway (69), hamilton (9), leslie odom jr. (6), theatre portfolio prep (42). 1/125; f/3.2; ISO 125; 85.0 mm.